ĐÀ NẴNG — The central city has asked the investor of the underdeveloped Eden Hotel project in Ngũ Hành Sơn district to dismantle illegal construction items before May 25. The city also fined the project owner, Minh Thùy construction company, VNĐ90 million (US$4,000) for their violations. 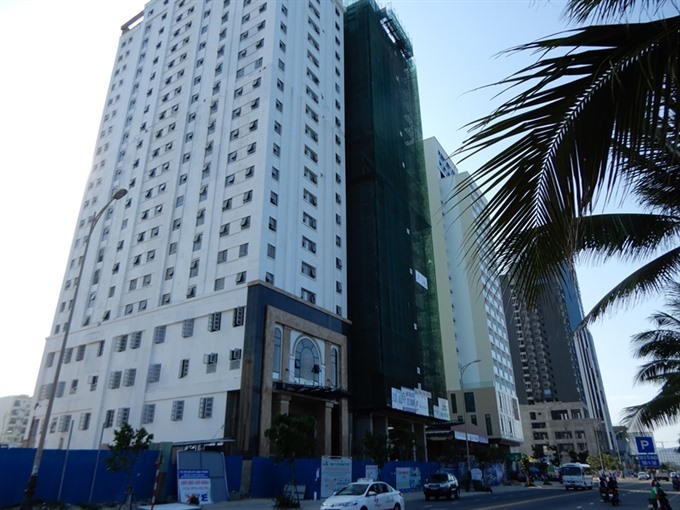 According to an inspection team from the city’s construction department, the Eden Hotel, which is part of the Royal Era 1 apartment and trade complex, was planned with 23 storeys (96 rooms) including a basement in 2016. However, the project owner intentionally developed one more storey and increase the number of rooms to 226 by January of 2018. The construction progress of the hotel project was then stopped by the inspection team. The project owner submitted adjustments to the design, but the city rejected the revised plan. Earlier, the city also fined the Empire Group, owner of the entertainment CocoBay complex VNĐ40 million ($1,800) for developing a building without a construction licence. In 2016, the city also suspended illegal construction at the 42-storey Mường Thanh Apartment project in Ngũ Hành Sơn District when the investor changed designs of a kindergarten and parking area into 104 apartments for sale. In January of 2018, Đà Nẵng fined the owner of The Song - Đà Nẵng Beach Villa project VNĐ100 million ($4,400) for an illegally enlarged beach resort in Ngũ Hành Sơn District.